Most average drinker’s aren’t used to eggs being involved in their cocktails, however any true cocktail aficionado will tell you, if there ain’t no egg white in your sour… it aint right! I love any use of eggs in my cocktails. There are basicaly four categories of cocktails that use eggs: sours, fizzes, flips and nogs. 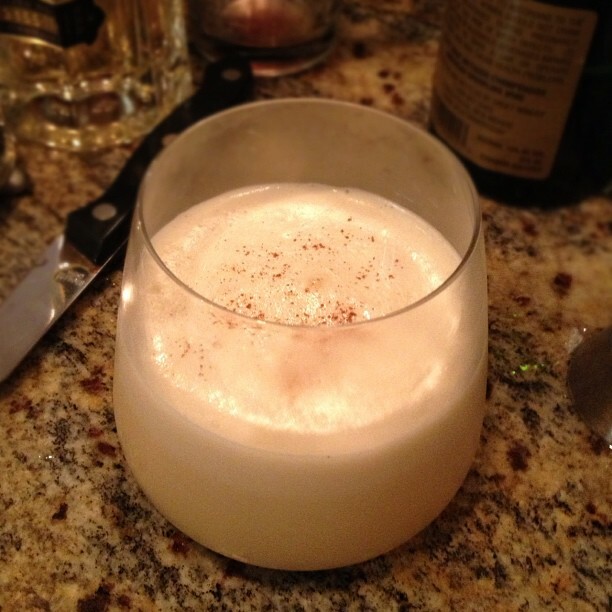 Sours and fizzes call for only egg whites while flips and nogs use the whole egg. Besides sours one of my other favorite cocktails is the flip. One of my favorite drinks to order when I am at The Varnish in downtown LA is the BAC Flip (Bourbon Apricot Cynar). In making my own flips at home I decided to try one with my Pistachio Fig infused Bourbon and boy was it delicious! Tags: Egg White, Eggnog, Eggs, Varnish. Bookmark the permalink.